Arlene's parting card is an example of creating scenes without a lot of stress. 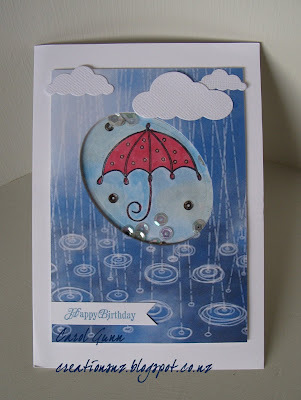 See her card and information on making this card at A Bit of This and That. Cindy went with butterflies and some "very treasured" designer papers. 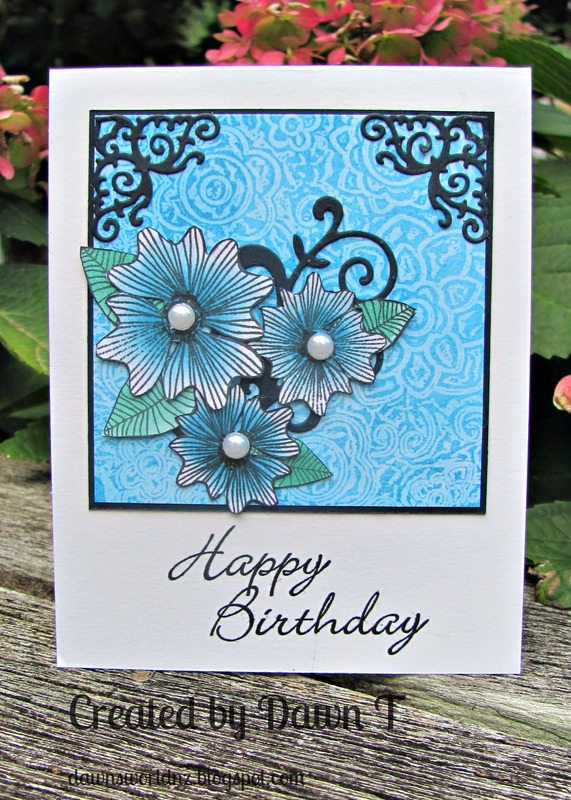 For her supplies, visit Escape to Stamping. 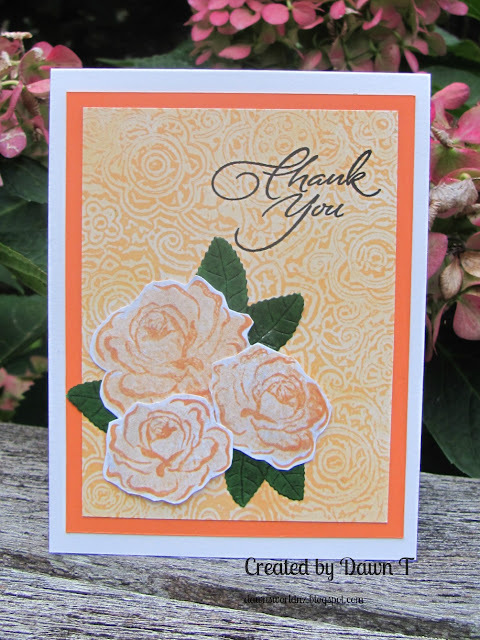 Thank you to Gina K Designs and all who participate in our challenges. 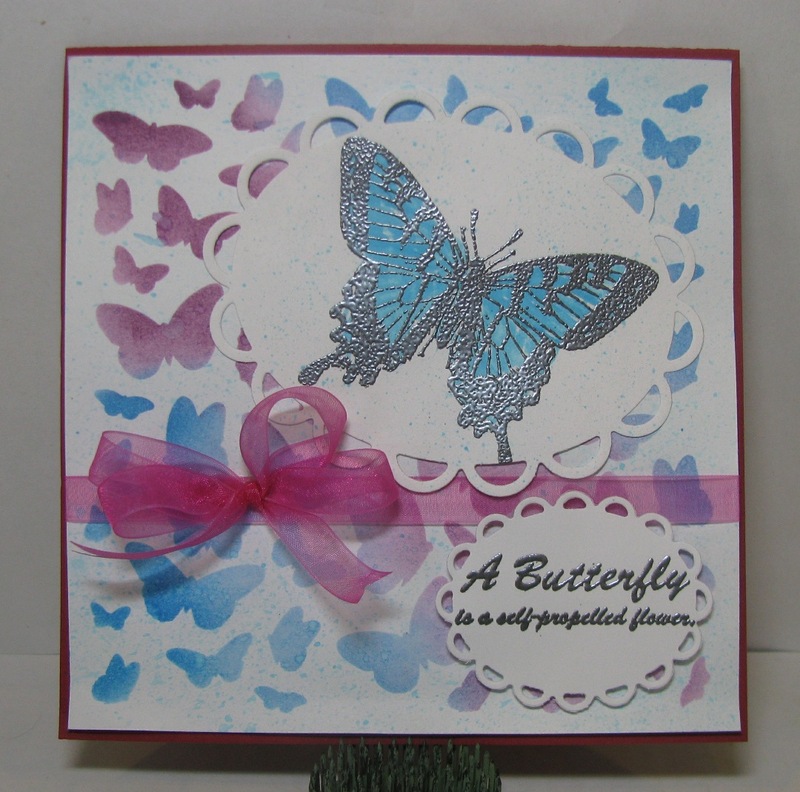 The stamped oval, sentiment and butterfly are all from the Warm Spring Wishes set. I hand cut the circle and added it over a die cut Spellbinders Fancy Frame. The butterfly was coloured and then fussy cut. I finished by die cutting a stitched rectangle from some PP. Finished with some pearls. The sentiment is inspiring so this card went to a friend who has been through some hard times and is now coming out the other side. Just to remind her that she is strong. thanks to all our entrants this month and a big thanks to Gina K Designs who is our fabulous sponsor this month. 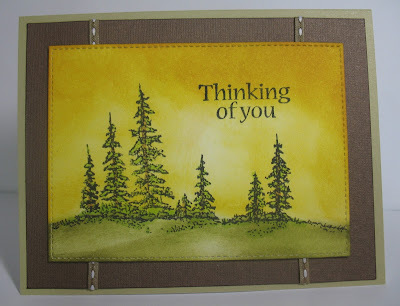 Hello Cindy here to share a card to celebrate Tell a Story Day. I kid you not, check this calendar for destails. April's challenge theme is April (such as Easter, Rain, Storms, April Fools Day, Spring, Autumn, IRS/Taxes) or April holidays (www.holidayinsights.com), and today is Tell a Story Day. Gina K. Design is our sponsor this month. There is still time to enter this month's challenge. You could win a $25 gift voucher to the store. 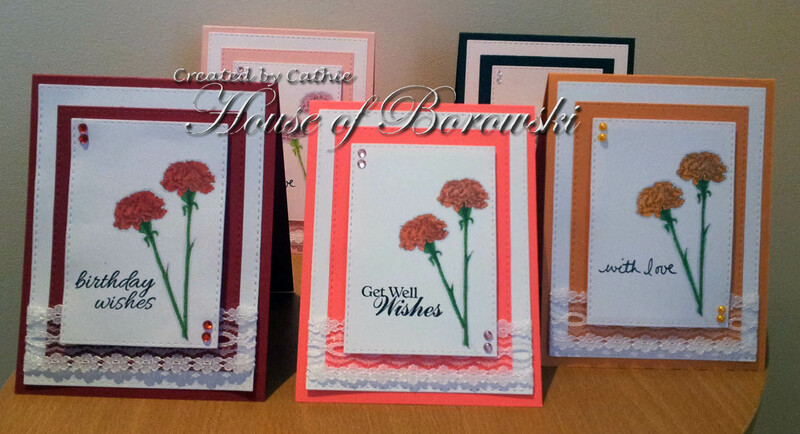 Card stock in Cherry Red, Lipstick, Black Onyx, Sweet Mango, Innocent Pink. Simon Says Stamps Stitched Rectangle. Today's card is a simple birthday card. 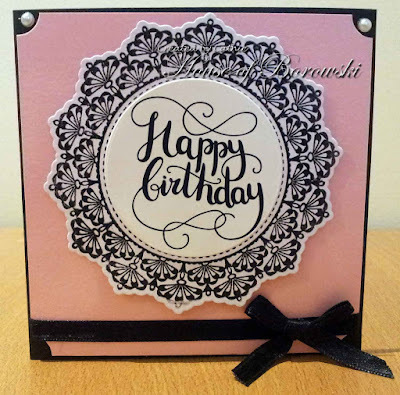 You may notice a theme to my cards for the Diva's this month and that is because I decided to make them all using the same set from Gina K Designs (our fantastic sponsor this month). 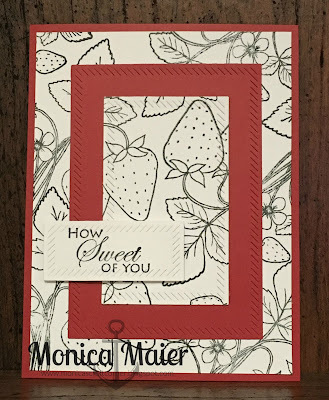 I'm using the sweet strawberries theme set because I love strawberries and April is the month for the Poteet, Tx strawberry festival (which I loved to go to when we lived there). Don't forget to join us here and link up for your chance to win a gift card to Gina K Designs! I used the Gina K. Designs Butterfly stamp (Hope is Faith set), and Spellbinders Scalloped Ovals dies. Hope you're enjoying the month of April!! I think by now you know that our April's challenge theme is to make a project you associate with April (such as Easter, Rain, Storms, April Fools Day, Spring, Autumn, IRS/Taxes) or April holidays (www.holidayinsights.com). There is still plenty time to join in the challenge. This month's sponsor is Gina K. Designs. You could win a $25 gift voucher to the store. Our sponsor this month is Gina K Designs and if you are unfamiliar with her range you will be surprised to know that she doesn't just stock stamps but her own brand of inks, card stock, pattern paper and embellishments as well. On my project I have highlighted quite a few of these unsung heroes on a card for my nephew. Spellbinders Standard Oval Large, Standard Scallop Oval, Lil'Inkers Mini Bow die. I decided to try out a Swing card. 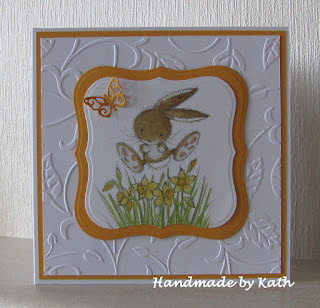 For more details hop of to my blog to see more details. I think my sky says spring and a full stream cursing along the stream bed. 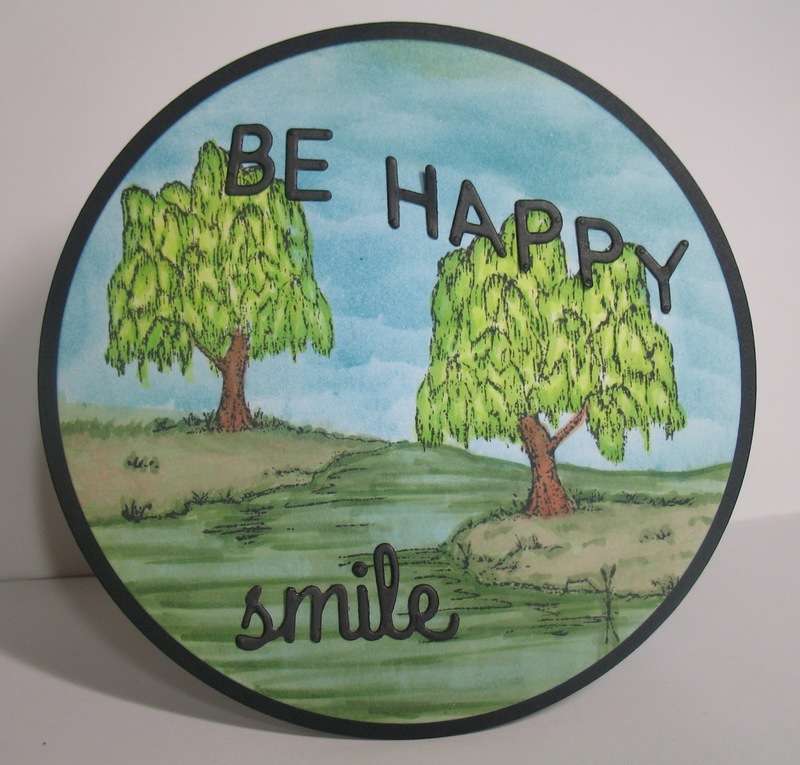 The colors I used for the weeping willows seem to spring. out to you. I used Copic markers and inked the sky with one of my favorite distress inks, Broken China. I used a torn piece of paper to sponge on the sky to give it depth. I swiped Copic marker E31 across YG 61 for the ground and I think that says a brown land turning green. The card is about 5 inches by 5 inches. You can see my blog post at A Bit of This and That. 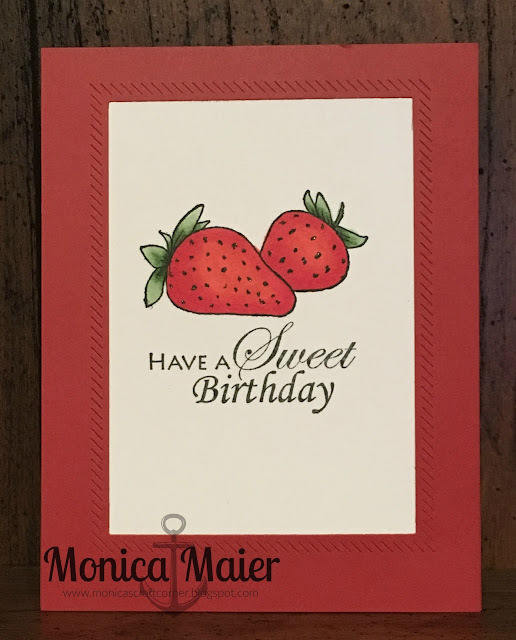 I couldn't wait to do this technique as it has been a few years since I tried it out... so here's my results of embossed wax background. I CASE'd Gina's card for this first one. I used Mermaid Lagoon distress ink to sponge the background. Not sure who makes my folder as it has no name on it... But it was a great one to use, being very detailed. 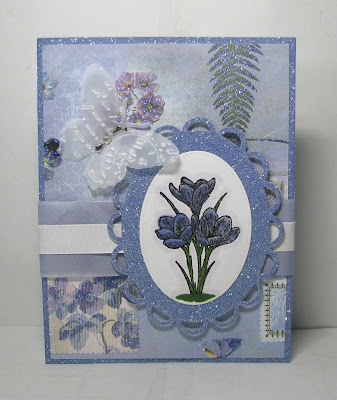 I then used the flowers and leaves from Warm Spring Wishes and coloured with Distress inks and daubers before fussy cutting. The sentiment is from Frame and Flowers 2. I used a La La land die cut for the corners. And my flourish was one that came with a magazine so has no name on it. 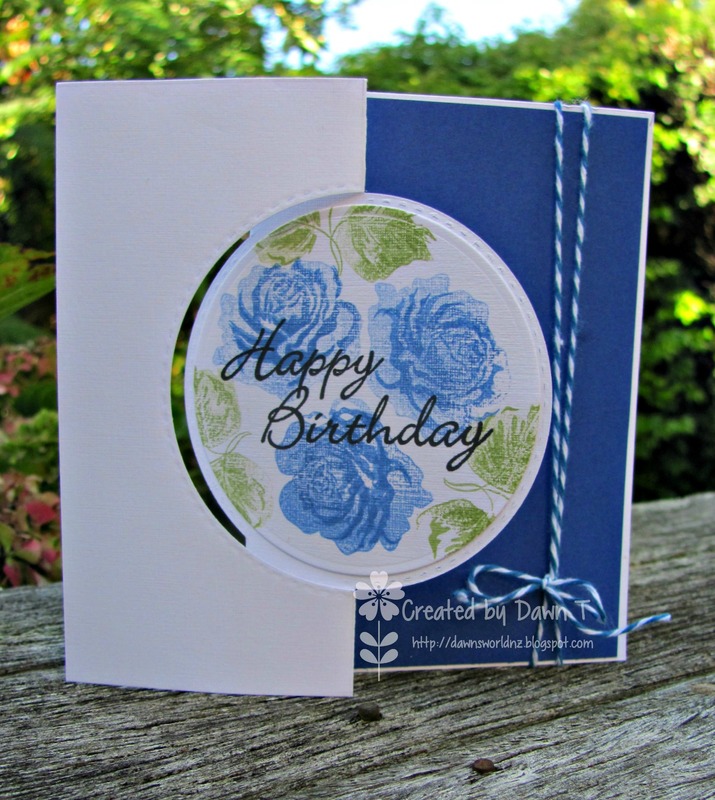 My mat and the corners and flourish are all dark blue card. This one was sponged with Dried Marigold distress ink. The flowers are from Frame and Flowers 2 and were stamped with Hero Arts Apricot ink - first layer stamped off and then the second layer being full strength. 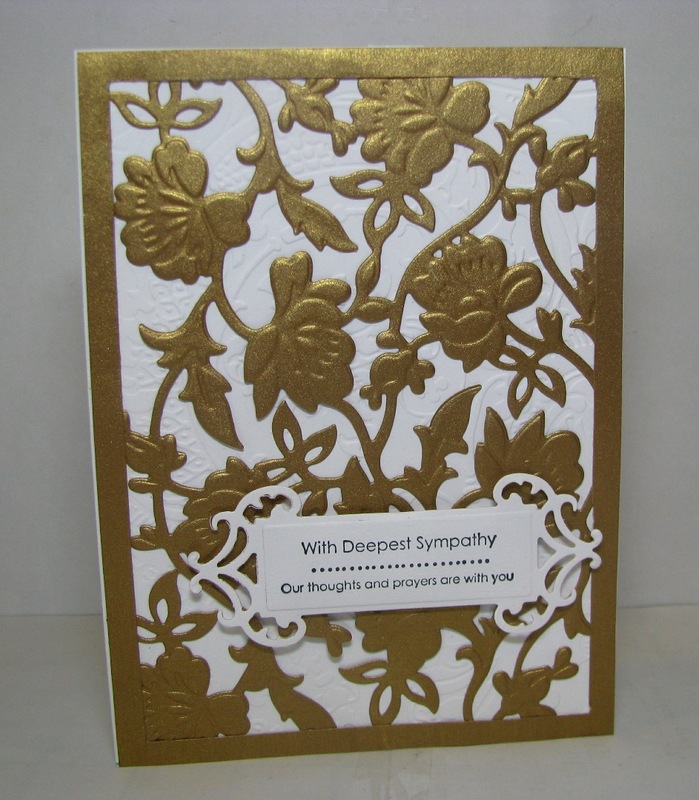 The leaves are die cut with a MFT dienamics leaf die. I added some Spectrum Noir glitter pen on the roses. 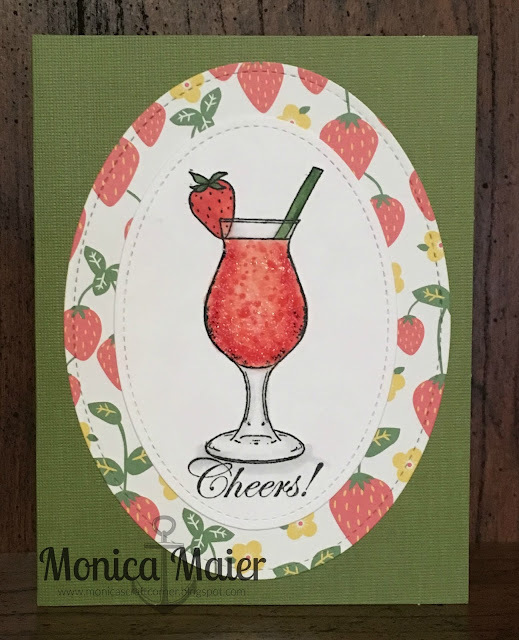 If you haven't checked out Gina K design's Stamp TV, I can totally recommend it..
Hello everyone Monica here for the Diva's today to share my first card for out April Challenge. Our wonderful sponsor is Gina K designs, for your chance to win a $25 GC for her shop enter your card here! My card is for those of you dealing with Taxes, celebrating they got them in already or for anyone who loves a good daiquiri! I used the Gina K Sweet Strawberries set, some old Lawn Fawn paper and oval stitched dies. Added a bit of stickles to finish it! We can't wait to see what you create for us! 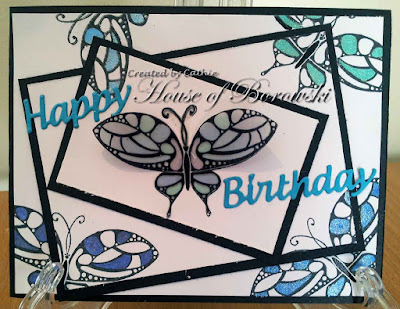 Today we are talking to the fabulous Gina Krupsky, the company owner of ginakdesigns to get the inside scoop. I started Gina K Designs because I often linked to draw images If I couldn't find one in my collection after the stamp company that I was demonstrating for changed their career plan, I changed mine and started my own company. 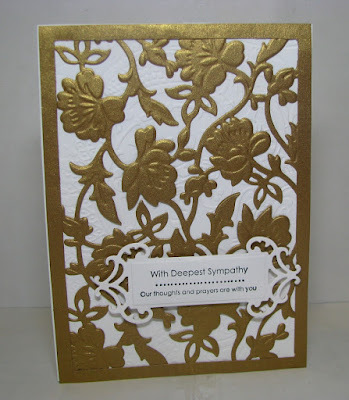 I personally LOVE embossing powder. I use it all the time and the love the variety of techniques you can do with it.I also think it gives cards such a polished look. Where else can our followers find inspiration on your products? 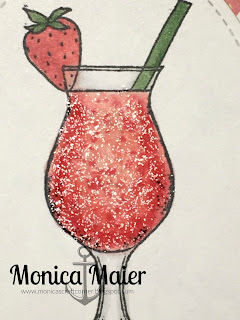 Do you have a design Blog or Facebook page? I mostly think of lighthouses in the spring, seeing the California seashore up by Crescent City where you can walk out to the lighthouse at low tide. I have so enjoyed working with these stamps. 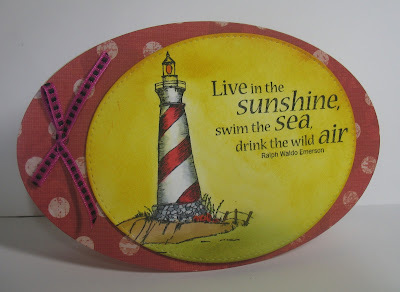 I love lighthouses and of course had to make a card with one from the stamp set By the Sea. I hope you enjoy her stamps as much as I do. I used Copic markers on the lighthouse image itself and then used Distress inks to complete the sky and hint of water or grass, depending on your perspective. You can catch me at A Bit of This and That. Sometimes, I just want a card that I can grab and is good for any occasion. I can write whatever I want inside, or stamp a sentiment that fits the occasion. 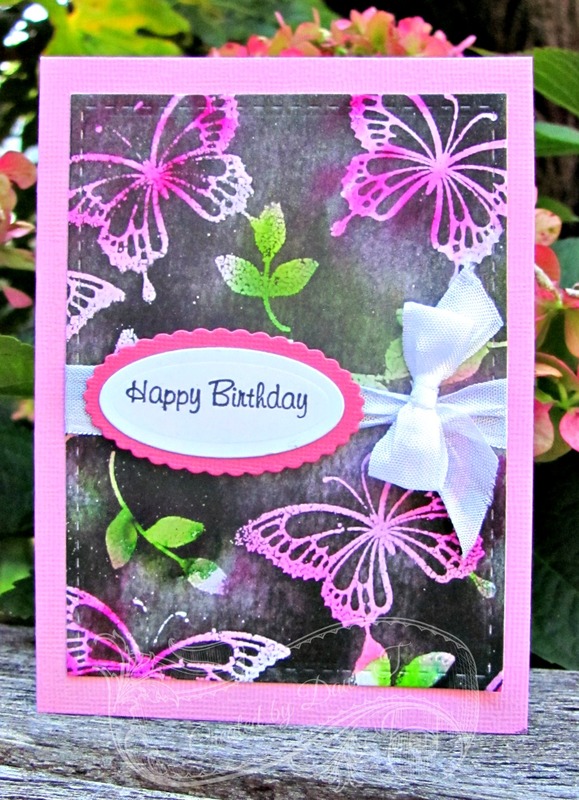 And who doesn't like flowers and butterflies? 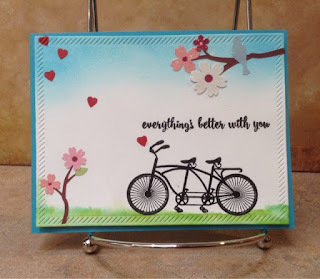 I used Gina K. Designs Spring Florals , and the My Favorite Things (Stitched Oval) dies, Spellbinders (Scalloped Ovals) dies, and the Cuttlebug (Butterflies die & embossing set). Make sure to enter our April Challenge for a chance at the Gina K. Designs gift card! Gina K Designs stamped umbrella with die cut oval and clouds. Come join us this month ! I hope everyone is enjoying Spring! its been very nice here, not much rain as of yet, but warmer weather is finally here. Oh and I guess I should mention, I know we offered a prize this Month but I'm afraid it is no longer possible, I feel really bad for all of you who tried so hard, you really earned it, but sometimes these things just happen and there is nothing we can do about it. Even though technically this is a day late. LOL I know that was very lame of me but I just had so much fun typing all that up.... Enough Silliness, Now to announce Our Winners! Congratulations to #138 Bad Kitty!! love the real spring look. Cindy.... it wasn't easy picking a favorite. However Angie's lovely scene made me dream of going outdoor and get some fresh Spring air!! Arlene: It was difficult to choose, but # 61, Helen, is my choice. I love the coloring of the girl and lovely simple design. Cathie - I love the 3D effect of these flowers, they are so realistic and so bright. Dawn has used Warm Spring Wishes to make a birthday card with a Spring theme. Arlene has gone to the pelicans, quite literally. When spring approaches the white pelicans begin their journey north again. This cycle is repeated every year. This is why they are often referred to as "snowbirds". This set is titled By the Sea. 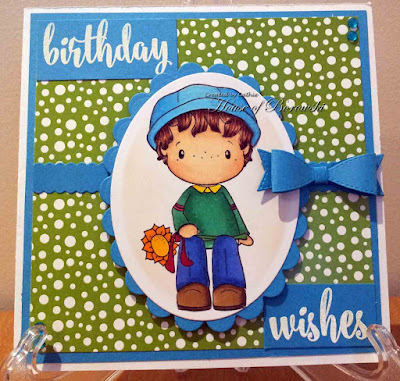 Cathie has done a simple birthday card inspired by bright spring colours all with Gina K Designs products. 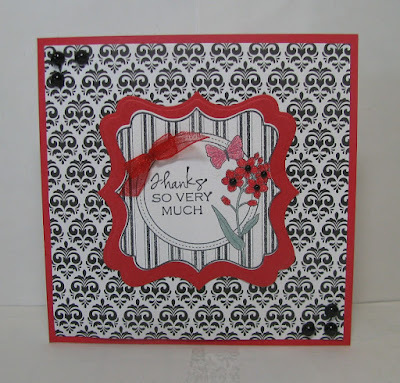 Frame and Flowers 1 clear stamp set and Fancy Frame die set 1.